With all due respect to Anthony Lake's Aug. 10 Otherviews column Young AIDS victims in Haiti need a new plan, the United States is at the forefront of the global fight to eradicate the spread of HIV/AIDS, and we have been especially active and effective in Haiti. Haiti is one of 14 African and Caribbean countries set to benefit from a major new initiative in President Bush's emergency plan for HIV/AIDS relief. Haiti already has received money and begun programs under the president's International Mother and Child HIV Prevention Initiative. The U.S. Agency for International Development has budgeted $7.75 million to support a variety of programs in Haiti to fight the disease during the current fiscal year. The United States will contribute an additional $1 billion to the Global Fund to Fight AIDS, Tuberculosis and Malaria over the next five years, on top of the more than $600 million that we have already committed. Health and Human Services Secretary Tommy G. Thompson currently chairs the Global Fund board. One of the first grants approved by the fund in April 2002 provides Haiti with $24 million for a variety of HIV/AIDS projects in both the public and private sectors. Because of concerns about official corruption, the absence of proper accounting and the lack of transparency in the Haitian government, we prefer to channel the vast majority of our aid to nongovernmental organizations that have a proven track record. To do otherwise would be a disservice to thousands of people living with or affected by HIV/AIDS as well as the potential victims of the disease. We look forward to the day when a Haitian government makes a serious and effective effort to tackle the corruption permeating its ministries. Until that happens, we have no choice but to channel our support through reliable organizations that help those infected and affected by HIV/AIDS in Haiti. Reprinted from The Miami Herald of August 21, 2003. NEW YORK, Aug. 6, (Reuters Health) - A stand-alone center in Port-au-Prince, the capital of impoverished Haiti, has a success story to tell. The clinic was set up in 1985 to offer voluntary HIV testing and counseling. In the Journal of Acquired Immune Deficiency Syndromes, doctors describe how basic health care services were progressively added to the clinic's operations of the following 15-year period. During this interval, the number of individuals counseled and tested for HIV annually rose from 142 in 1985 to 8175 in 1999, Dr. Warren D. Johnson Jr. from Weill Medical College of Cornell University in New York and colleagues report. In 1999, 30% of adults and 10% of children tested positive for HIV. During 1999, more than one third of adults who came to the clinic and over half of those testing positive for HIV benefited from at least one of the primary care services (including HIV care, tuberculosis management, sexually transmitted infection management, and reproductive health services) offered by the clinic. "While some view HIV care and HIV prevention as opposing programs vying for limited resources, we believe that prevention and care are synergistic and forged together will be a powerful weapon in the fight against AIDS in Haiti and in many other developing countries," say the authors of the article. The clinic's efforts paid off in preventing sexual transmission of HIV. Many of the HIV-positive adults told a sexual partner to go for HIV testing and counseling. Of the 85 uninfected spouses who underwent repeated HIV testing, none had become positive during an average follow-up period of 18 months. HIV-positive pregnant women were provided antiretroviral therapy to prevent infection of their infants. According to the report, only seven children became infected, representing an infection rate half that previously seen in Haiti. "This report demonstrates the feasibility, demand, and effective synergy of integrated on-site primary care services and HIV VCT in Haiti," the team concludes. SOURCE: Journal of Acquired Immune Deficiency Syndromes, August 1, 2003. It's a mission that began in the most tragic of circumstances, when a prominent Haitian businesswoman realized that, in a country of more than eight million people, her husband could not get the emergency medical care he needed. So seven months after frantically driving her husband around Port-au-Prince in a futile search for urgent care, Dominique Carvonis is on a mission to save lives. She is now a widow. Her husband, Michel Carvonis, suffered a stroke and could not get proper treatment within the critical first three hours. Eventually he was airlifted to Miami, but it was too late. He died a few days later. Now Carvonis, a 46-year-old Haitian hotel owner, is traveling to Haitian-American enclaves throughout the United States and Canada in hopes of raising money -- and awareness -- for her crusade: to construct and equip a 6,000-square-foot state-of-the-art emergency room and intensive care unit in the Haitian capital. ''There are great doctors in Haiti, but they don't have the proper equipment,'' Carvonis said last week, after pleading her case to medical professionals at Baptist Health South Florida and before traveling to Montreal to make a similar plea. Dr. Pierre Mercier, a Port-au-Prince physician who works in public health, said that while Haiti boasts several public and private hospitals, they are poorly equipped. During meetings at South Miami and Baptist hospitals, Carvonis recalled the helplessness she felt after Michel suffered a stroke in the middle of the night in January. 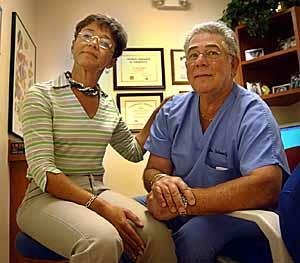 With her daughter calling the doctor on the cellphone, Dominique Carvonis rushed Michel, a prominent dentist, to a hospital. Fifteen minutes after the family arrived, they were told that Michel would have to be taken to a private, mobile unit for a CAT scan, because the hospital could not perform the critical test. Michel Carvonis died a few days later at Cedars, where Pereira was the attending physician. Carvonis was 53. ''If my husband had received the proper treatment, I am sure the situation would have been different, medically speaking,'' Dominique said. And so was born the Michel Carvonis Foundation and an ambitious plan to raise $3.5 million in cash and equipment for the first phase of an emergency room and 10-bed ICU on the grounds of the privately owned, not-for-profit Haitian Community Hospital in Port-au-Prince's Petionville neighborhood. So far, Carvonis said she has raised $20,000 -- mostly from the word-of-mouth contributions of Haitian Americans. In addition, Dr. Laurence Schwartz, a Broward County orthodontist and longtime family friend, raised $5,000. The funds are being collected by the Haitian Community Hospital's foundation, which is set up in Miami. Cedars has agreed to donate some equipment, she and Pereira said. Carvonis is also seeking technical assistance with the training of emergency room technicians and nurses and a business plan for the clinic's construction. Sparger said a group from the hospital network plans to go to Haiti soon to look at the site. Baptist Health South Florida and its network of four hospitals has worked with medical professionals from several Caribbean islands, including Turks and Caicos, and Jamaica. About five years ago, the network helped establish a clinic in Montego Bay, Jamaica. Using a video camera and a telephone, a doctor at the Montego Bay clinic can consult with a doctor in Miami about a patient.